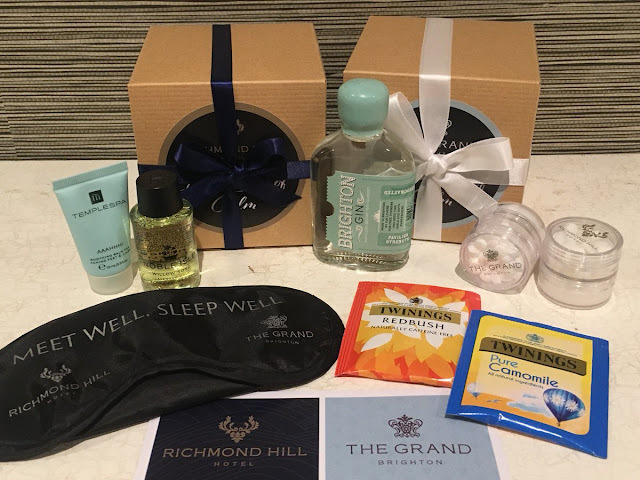 In celebration of UK #EventWell17 week that took place last week, The Grand Brighton and Richmond Hill Hotel launched their own campaign to promote wellbeing within the events industry. The ‘little box of calm’ contains a selection of wellbeing goodies. From relaxing bath essence from Noble Isle and soothing foot balm from Temple Spa, to the hotels’ very own ‘Conference Cool Down’ playlist on Spotify, all items aim to promote calm and offer organisers some light relief from everyday work pressures. Following recent statistics on the stresses of the role of an Event Organiser, both properties understand that they can play an essential part in helping to eliminate some of the pressures associated with organising events. From the enquiry stage to the co-ordination of the event, their experienced teams can offer a guiding hand. From working closely with the client on seamless event set up and flow to imparting their knowledge on event enhancements and delegate activities, taking advantage of the venues’ unique locations. Despite Eventwell17 being only a week long campaign, the hotel's own campaign will extend into late September and October. Alison Edwards, Director of Sales comments 'our people and our locations are what make both venues so special, from a Sussex vineyard or beach team build in Brighton to an afternoon in the Royal Park or on the Thames in Richmond, both destinations offer an array of very unique off-site delegate activities. The invigorating sea air and green open spaces breathe new life into events bringing a fresh approach towards improving physical and mental wellbeing. Both properties place event food high on the agenda with menus available to stimulate, motivate and excite, keeping the audience focused throughout, incorporating locally sourced seafood, known to benefit from essential Omega-3, the perfect brain food, fresh vegetables, grains, pulses and other energy boosting cuisine, can all be incorporated to promote wellbeing. Andrew Mosley, General Manager at The Grand Brighton said: 'Following news coverage about work life pressure, it is great to see the events industry come together to introduce a positive approach to wellbeing, something we are proud to champion. We want to encourage professionals in the industry to take time for themselves and we hope they enjoy the pampering elements of the wellbeing kits'.